Having an effective golf warmup routine is one of the best ways to start off your round. The main components of the warmup should include static and dynamic stretches, practice swings, and some putts on the practice green. There are two types of stretching that you should perform in your golf warmup. The first one that we will discuss is static stretching. Most people who have played sports throughout their life are familiar with this type. It involves targeting a specific muscle group, performing a stretch, and then holding for a determined length of time. People have been promoting this type of stretching forever! However, current research in this area has shifted the focus to a different type of stretching called dynamic stretching. These flexibility exercises are performed quickly, with ballistic-type movement. There are no hold times with dynamic stretching! The advantage of dynamic is that it is more sport, or activity, specific. In general, sports are performed with fast, rapid movements. There are very few movements that require you to hold a motion for 20-30 seconds. It is my belief that a good golf warmup should include a handful of both types of stretches. In order to prepare your body for performing a repetitive motion such as the golf swing, it is a great idea to take some practice swings prior to heading to the first tee. 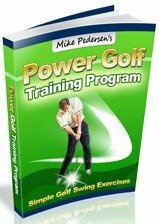 Take a couple minutes after stretching and perform some swings of various lengths to get your body acclimated to swinging a club again. Your brain develops "muscle memory" over time and taking some easy swings is a good way to refresh that memory. Hitting a bucket, or half bucket, of balls would be great if there is a range available but its not required obviously. Your best opportunity to lower your score lies on the green. How are you going to assess how fast or slow the greens are if you don't take a few putts ahead of time? Just like with anything else, you have your trusty muscle memory to help you out, but wet or dry conditions could significantly alter your perception of how much force to use while putting. While you are over there, bring out a wedge and try some chips as well!